The mother left back to Arizona the other day, after a wonderful visit. For part of my moms time here, her sister – my aunt – also stayed with us. So one day I took the ladies to lunch. And we drove there. While they loved lunch (great restaurant right on the water), they did not love my driving to get us there. You briefly go the wrong way in a lane and get a finger wagged at you by a guy driving in his that lane who needs to get out of your way, and all of a sudden you are a bad driver. 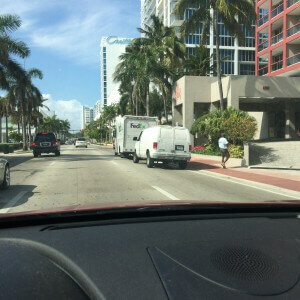 I pointed out to them that I was only in that lane for mere seconds, in order to get into the second lane that began just ahead for the cars going our direction. I even pointed out the not one, not two, but THREE cars who did the exact same thing when we were heading back from the restaurant and stopped at the light in that area. 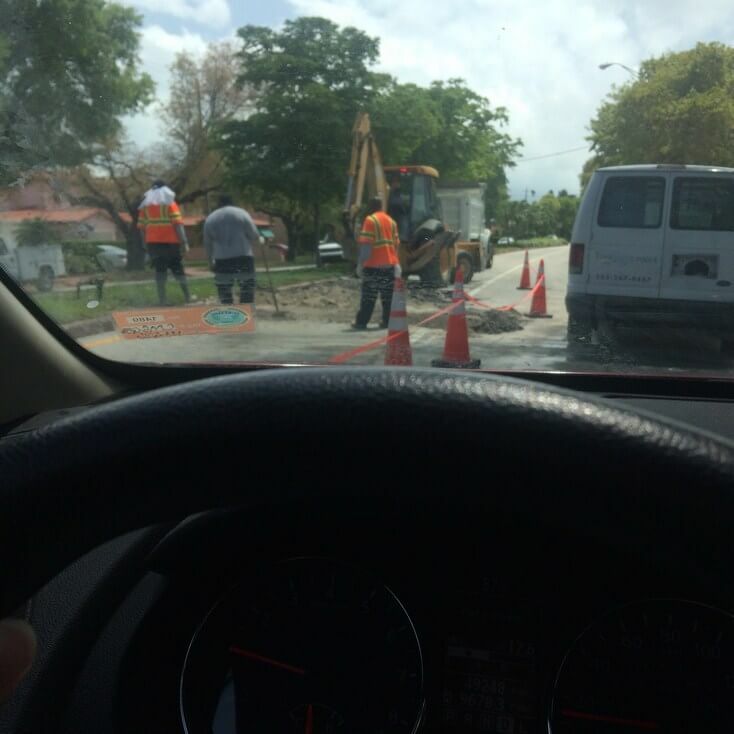 I tried explaining to them that this is how you drive in Miami. That driving in Miami requires strategy. Evasive maneuvers. Looking far ahead to predict which lane you will need to move into (because you always need to move). 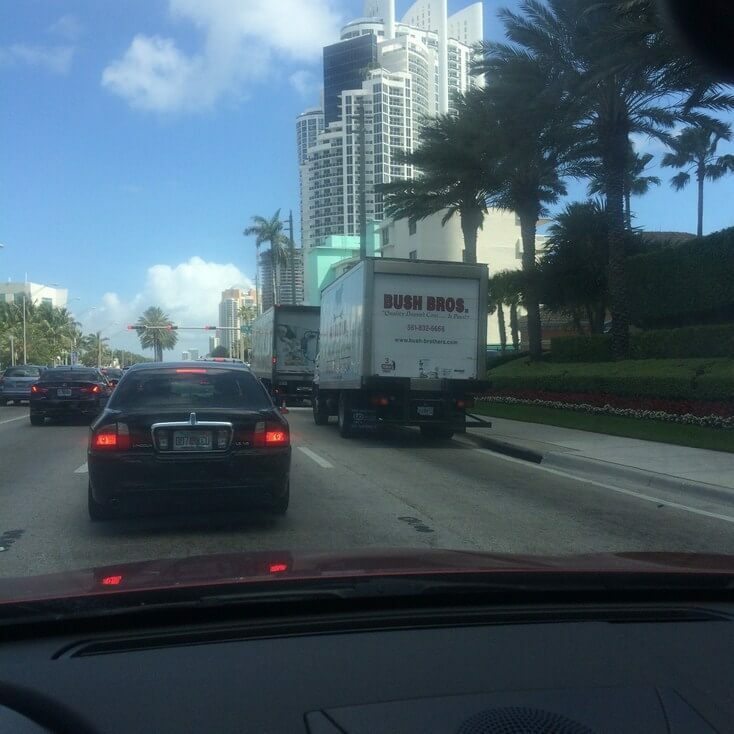 Driving in Miami requires liberal use of the horn. And a small amount of selfish, everyone else is doing it so I will too, douchiness. They were not swayed. So I decided to document my driving today, to show how anything (including driving in the wrong lane) is standard driving here. My first trip out today was to take the child to school. It’s just over a mile each way. Going there was smooth, no issues, all normal rules of the road followed by everyone. 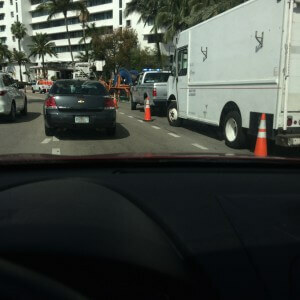 On the way home though, a trash truck decided to park in the lane right in front of the entrance to my condo building. 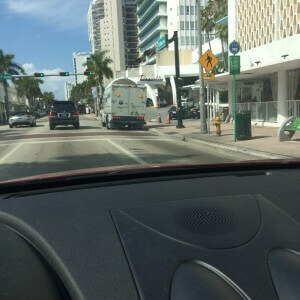 Which meant I couldn’t get into my building, until they had finished collecting the trash from the building next to us. Which has a perfectly good parking lot that the truck could have used, but for whatever reason didn’t. So essentially the truck and my car were parked in the street for a few minutes. And all others cars just had to deal with it. Trip two was to pick up some Girl Scout items from a friend at her work, nine miles straight down Collins (major main road). First problem – getting out of my building. 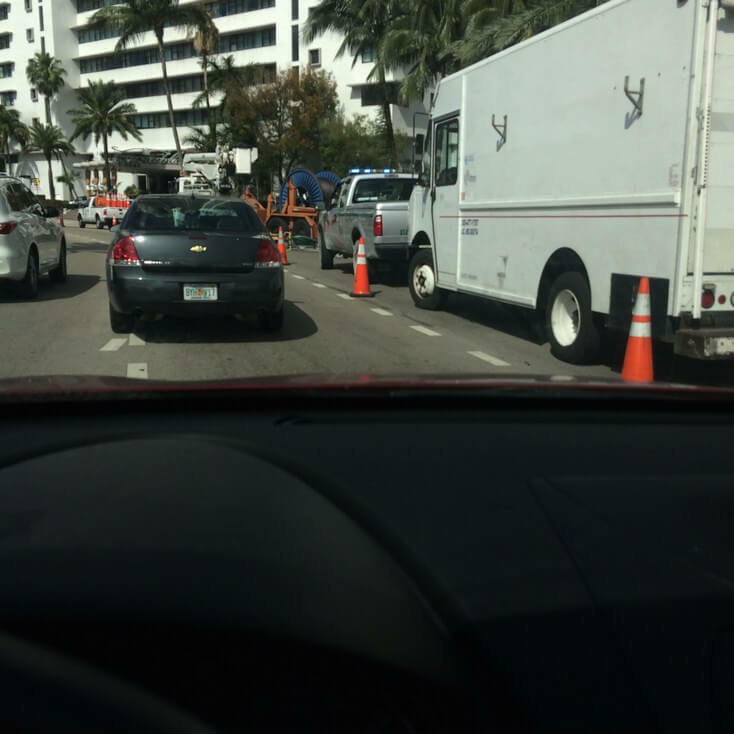 As the picture shows, the construction next to us has taken to shutting down one of the three lanes so that they can park their trucks there. The other day they actually had trucks on both sides of our exit, making it impossible for me to see. 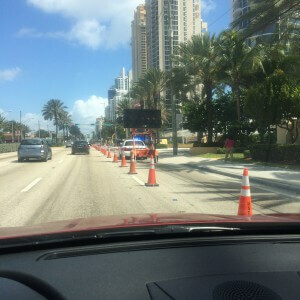 A cop had to step in and stop traffic on Collins for me, just so I could pull out (not going to lie, despite being annoyed, it was also a little Miami Level Trophy Wife feeling. Traffic on a major road was stopped. For me. I nodded my head and waved graciously to all). This is why all construction jobs are required to have an off duty cop on hand, because this is common. And again, all cars just deal with it. Which is why it wasn’t surprising when just a couple miles down the road, the lane was closed again, for another construction job. 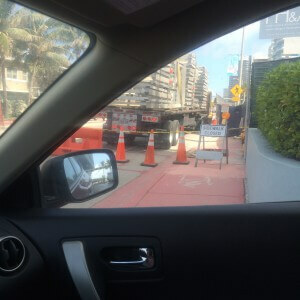 Then it was closed because two delivery trucks PARKED in the lane of this major street. Who knows how long they were there for. Then I was off Collins in the neighborhood where my friend works. 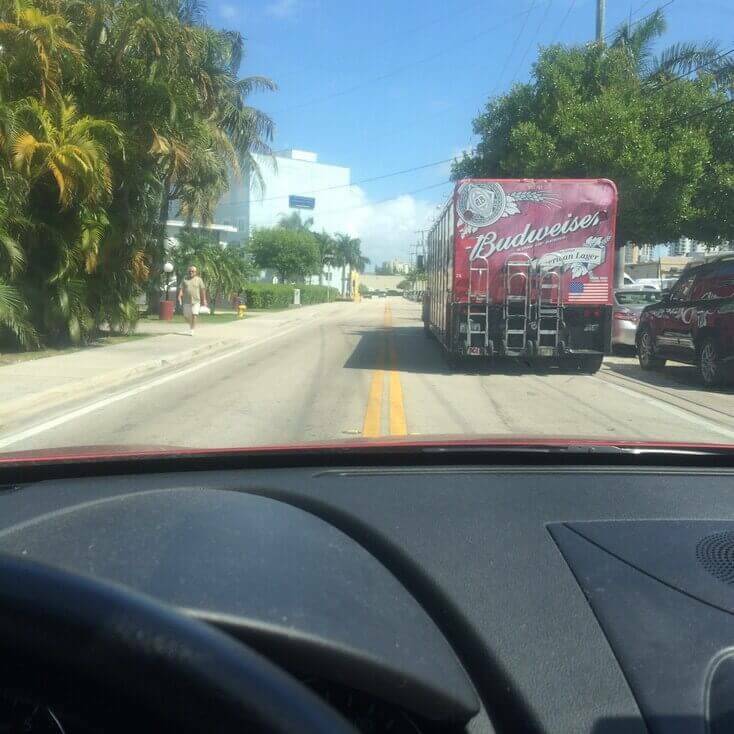 And where the Budweiser truck parked in the only lane for north bound traffic, forcing me to drive in southbound lane. Then I turned the corner to see another truck parked in the lane I needed to be in. 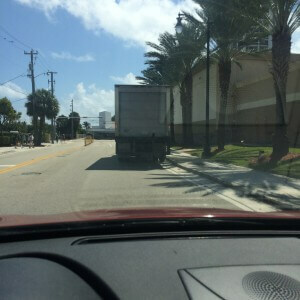 Again forcing me to drive in the other directions lane. So to recap, nine mile drive, unable to use a lane five times, two of which required driving in the wrong lane. Is it even necessary at this point to continue with trip three, a roughly five mile drive from the daughters school to Hebrew school? 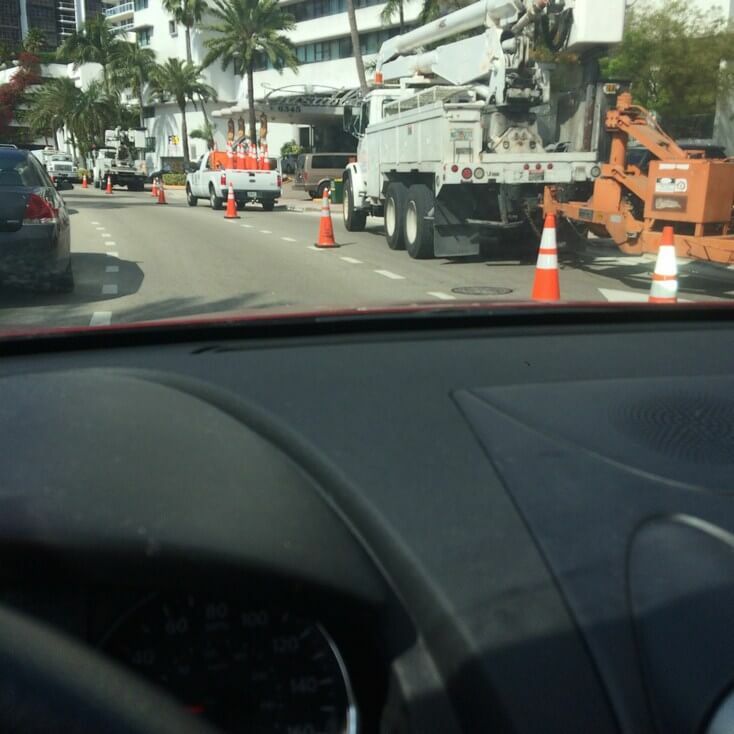 I’ll just show pics of five of the seven times that a lane was closed. I just hope the mom realizes that too, and will come back to visit again. And not just because she brings the awesome tortillas from Alejandro’s with her. She brought six packages this trip, which was more than we could eat quickly. Although we made a valiant effort. Including this delicious Spicy Black Bean, Chicken and Cilantro Wrap that I concocted one day, trying to use up ingredients in the fridge. 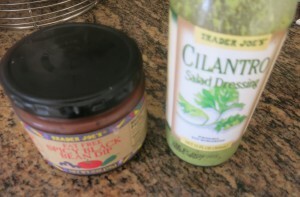 The spicy black bean dip and cilantro dressing are from Trader Joes. And from now on will be considered staples in my house, just for this wrap. 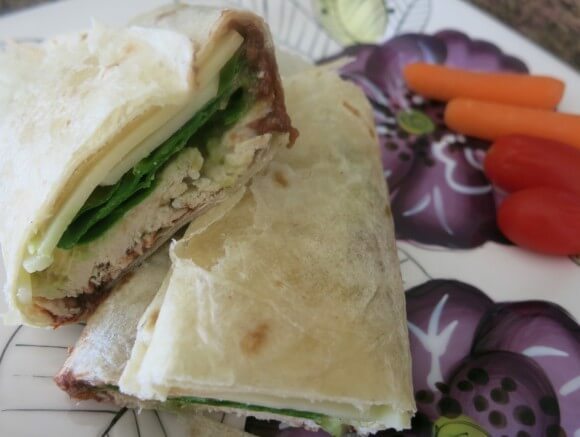 The creamy coolness of the dressing partners beautifully with the spicy black bean dip, to give the wrap depth of flavor, and prevent the wrap from tasting dry. And they are so good, that while I used chicken and provolone cheese cause it’s what I had, I think you could pair with anything. So drive yourself (in whatever manner necessary) to Trader Joes, and celebrate another successful accident free outing with this delicious wrap. Spread the bean dip on the tortilla. Layer the remaining items on top of the dip. I personally like to pour the dressing into the middle, as I feel that keeps it tidier by “sandwiching” the liquid in between larger pieces. Fold bottom of tortilla up, then sides of tortilla in, so that the only open side is the top. Hold tightly and enjoy!